Its been a busy month at Adur Design, we have a few more interesting WordPress website projects nearing completion and about to launch. We are very pleased with the way we have been working with our clients to produce creative, effective and mobile friendly responsive websites. We will be posting links and adding them into our web design portfolio once the new websites are released and are available to the public. If you would like us to look at your website project get in touch to discuss how we can bring our experience to help you and get your free web design quote. Call 07732 614914 or use our contact page. We get asked by new clients what is our process here at Adur Design. So how do we get your website designed and out there promoting your business? Well it’s quite simple, our system has been refined to a three stage process which will take your idea from sketch book to a new, fully functioning professional website. The Design phase involves a full consultation to find out what your website requires. We scope your website project and work out features, functionality, timescale and budget. From there we work on the website design, look and feel along with the user experience. We then produce design proofs will reflect the live website and incorporate your branding and style. Once the design is finalised we can then move to the build phase. The Build phase is where we take the finished design and build a prototype which is a live working website built out to match the design that we have produced. The various page templates are also built at this stage to match your content and feature requirements. The prototype website is tested for multi device use and you’re able to view the prototype website build at this stage so you can see project progress. Once the prototype build is complete we can then populate the build with your supplied content and launch your new website. The Launch phase involves a live hosting environment being setup and the prototype build is migrated to build out the live website. Final live testing is carried out and then all urls (website addresses) are then switched to point at the new website. Then your new website is now live for the world to see! We also offer training and support to help you make the best use of your website going forward. This training includes creating blog posts and editing page content and will help you take control of your web presence. If you would like to discuss your new website project, add in new features or bring a new look and feel to your website feel free to get in touch by calling: 07732 614914. You can also get a quote by getting in touch via our contact page. “I needed an online presence to showcase recent work and projects but only had basic knowledge about building websites. Ant Tyler at Adur Design produced a spot on web design for my art practice which he build into a WordPress website. Feel free to call 07732 614914 to find out how Adur Design can help you with your online presence. Responsive Web Design – Why Is This Important? There have been some developments in the web industry recently, some search engines are ranking down websites that are not responsive and usable on multiple devices. This means that unless your website has a responsive design and is easily usable on mobile and tablet devices this will directly effect where your website appears in searches. This is now termed as “mobile friendly” and has caused mixed feelings but overall it makes for a better user experience for mobile users which is now the fastest growing web audience. Google in particular are putting mobile users first and another factor to take into account is page load speed which includes optimised images, these are small file sizes which download quickly. You can see how your website is doing by entering the url (web address) into Google’s mobile friendly test. If you would like work carried out on your website which can include a design review just call 07732 614914 or use our contact page to get in touch as we’re happy to help! Adur Design has launched a new website to showcase the work of Alex Grosart. This clean and clear WordPress website was designed and developed from scratch by Ant Tyler. 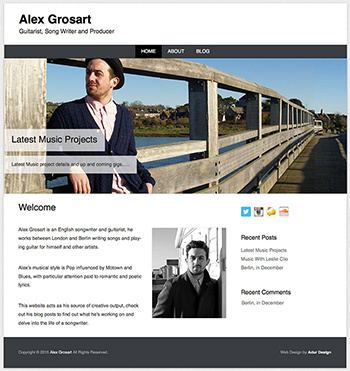 Alex can use his new WordPress website as an information hub to promote his musical projects. Alex is a talented guitarist and he can log in and blog about his latest song wrting and music production projects to bring you the latest news. This modern, responsive, WordPress website is designed for mobile and multi device use for every day on the move use. Basic WordPress website editing tuition was included in this website project to help Alex on his way. Find out more about our website projects by calling 07732 614914 or contact Ant through our Contact Page. Adur Design has launched another WordPress website re-design and development project for London based Pilates Yoga Movement. 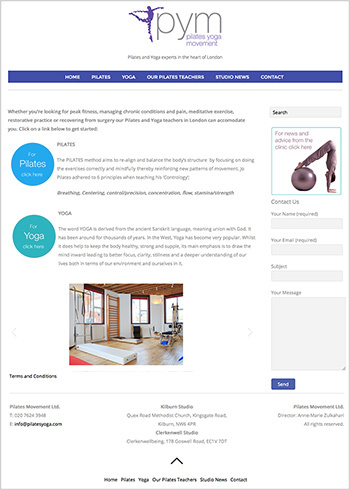 Pilates Yoga Movement London contacted us for a WordPress update and migration which included a re-designed and developed to include a responsive layout for mobile and tablet use and a contemporary design. Ant Tyler designed and produced this WordPress website re-design project and bought a fresh look and feel to the PYM brand which hold yoga and pilates sessions in Kilburn and Clerkenwell, London. This website project was also completed to deadline and budget with clear communication throughout. The new PYM website is built on the flexible WordPress website platform which allows PYM staff to edit content and create blog posts to bring you the latest pilates and yoga news. Find out more about WordPress web design and development by calling 07732 614914 or use the contact page to get in touch. Jacqui at Inspiring Introverts has recently written a LinkedIn review of Ant Tyler at Adur Design’s WordPress Training session. We put together a bespoke training program for a two hour session to cover a lot of ground. I hired Ant for a couple of hours bespoke training on WordPress to help set up my blog. It was really useful to be able to have a session tailored to my own needs with an expert like Ant, and thanks to the preparation he did beforehand we were able to cover a surprising amount of stuff in the time. And he even answered all my questions in words I understood! Very worthwhile – thanks Ant! To find out more about our WordPress training and how we can match your web design and development requirements just get in touch by calling 07732 614914 or use our Contact Form. Adur Design has just launched Furze Field Camping. 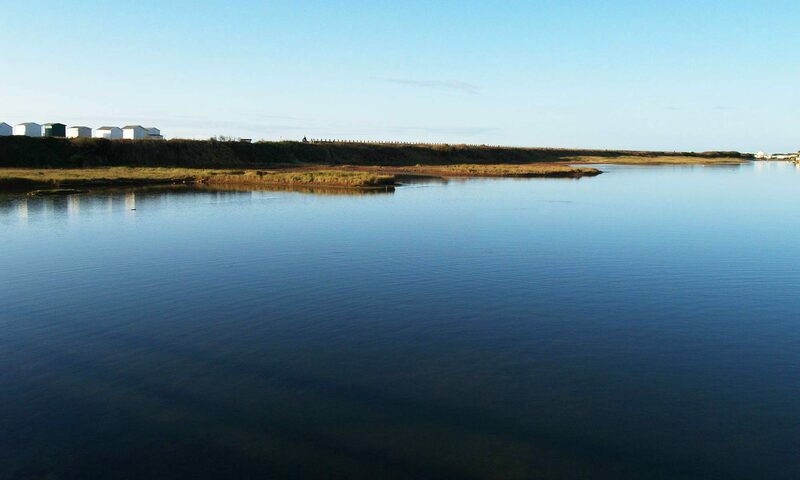 Designed and developed on the flexible WordPress platform Furze Field Camping promotes a friendly campsite set in the beautiful Sussex countryside. This bespoke WordPress website build was designed and developed from scratch to produce a modern, mobile friendly, responsive WordPress website. I’m reviewing WordPress starter themes again for a series of projects that are coming up. If you are new to the starter theme concept they are well worth a look as they save a lot of development time and are a good base to build a WordPress theme from. There is a lot of documentation availalbe and support forums for you to delve into should you need to. Just working on the latest WordPress website design and development project, this is requires working to a detailed project spec and calls for a bespoke WordPress build. A clean and minimal design is required and I’m using the flexible WordPress platform to deliver a modular website that can be built on as the business grows. We love the creative input and I’ll add a link to the Web Design Portfolio once this exciting website project is completed and launched.